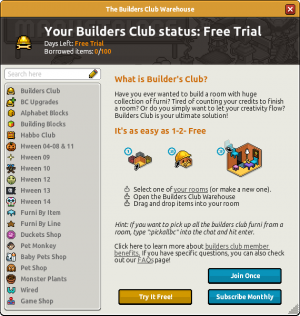 Builders Club is a room design orientated members club on Habbo. It is similar to the Habbo Club, wherein users pay a monthly fee in Credits. In the same way that Habbo Club offers exclusive clothing, furniture and room layouts - Builders Club offers a vast range of furniture, which remains the property of the member until they unsubscribe, though none of it is tradeable. The idea behind Builders Club was first piloted as an exclusive Group named Room Builders Inc. This group became a model and pre-cursor to the club feature, it appointed members to the group from a number of applicants, and tasked them with designing rooms for upcoming competitions, much of which ran through most of the 2012 Habbo calendar. This group, unlike Builders Club, did not have exclusive access to furniture, they instead had to create rooms with their own items, though they could work in teams to pool resources. Late in the campaign, a staff member would drop required items into the group rooms, retaining ownership but allowing members to design with them. The feedback received from this prototype group went on the shape the Builders Club feature. Members commented that access to a wider furniture base would have been beneficial, one that would not require spending large amounts of credits, which is very costly. Habbo, everyday, is adding new lines of furniture that you can access while in builder's club. They also allowed for another way to pay for your Builder's Club. The first way being was to pay a fee for it via SMS messages, where it would charge to your mobile service and now they have it where you can pay 85 Coins and 85 Diamonds. This page was last edited on 7 July 2018, at 14:13.